If you’ve never seen or held a Vaja Leather Case, it can be a little hard to qualify how much better they are than most of the competition. Since they aren’t available at typical retail outlets and there really aren’t many cases readily available that are close in quality, it’s hard to put the difference into words. 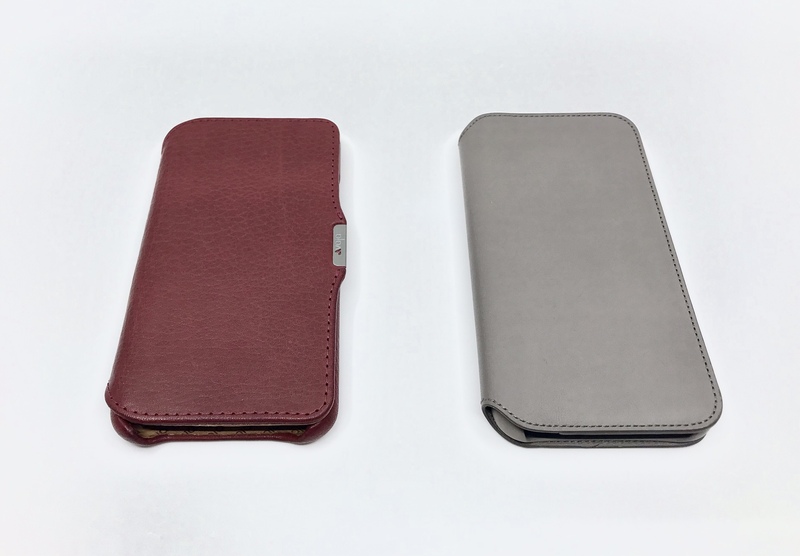 However, I can assure you that there is a perceivable difference in quality between this case and the run of the mill leather products that you can get for $50 and under, and the difference can be seen and felt in person. Anytime I hand a Vaja case to someone, they are surprised by just how nice it looks and feels in the hand. 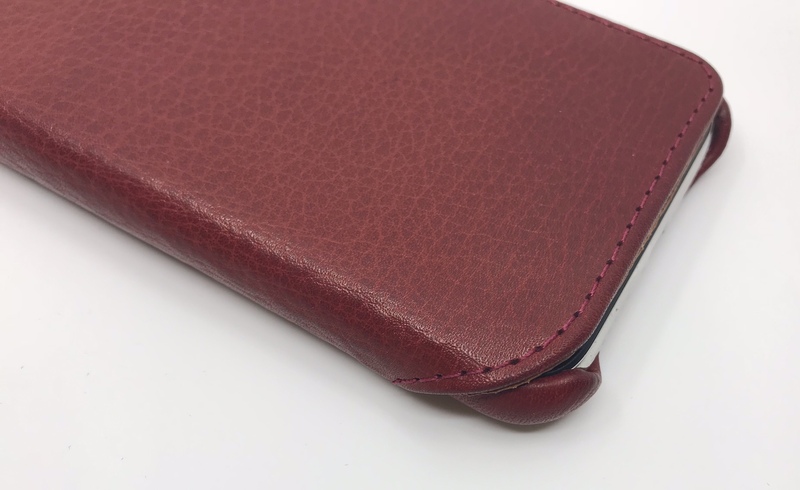 The primary element of any Vaja case is the leather. As already stated, this company is known for their beautiful Argentinian leather and their high quality craftsmanship, and you can see it all over their products. 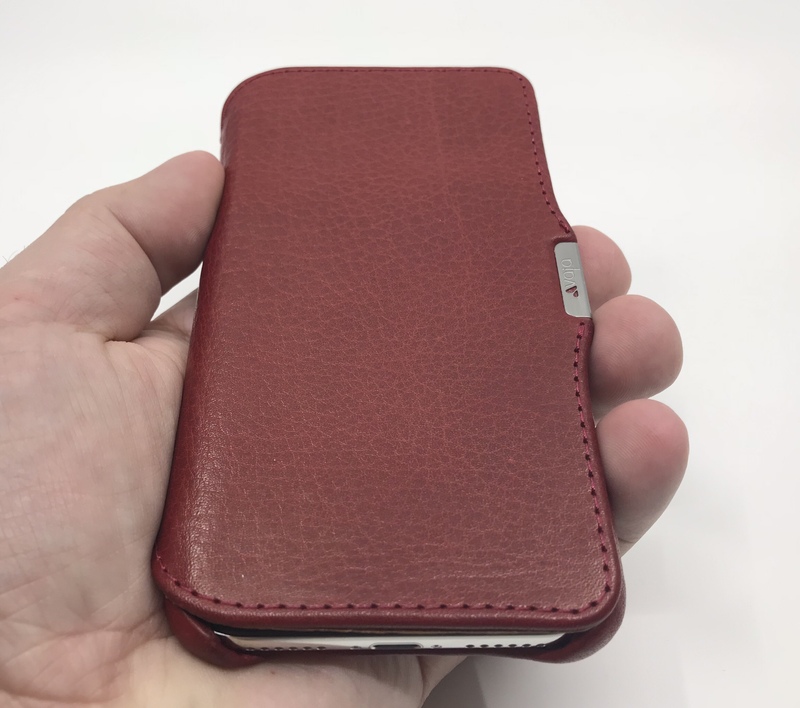 The Agenda MG case I received to review has a Bridge Leather Chili (dark red) exterior and London (natural tan leather) interior. 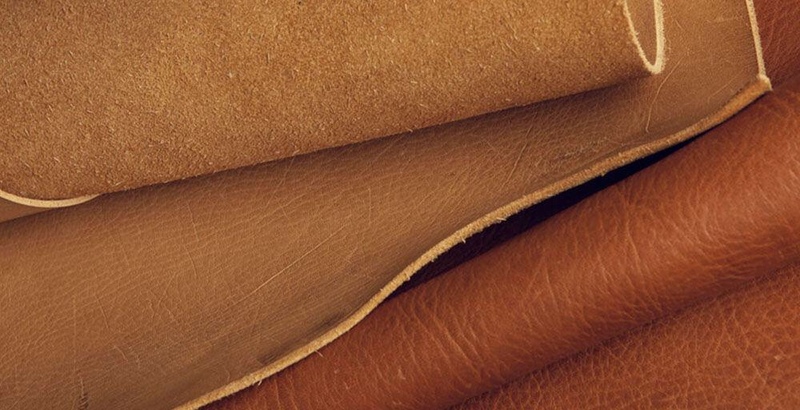 The Bridge Leather that Vaja uses is vegetable tanned, free from scarring and bug bites, and is not exposed to any harsh chemicals during processing. The result is a very textured, but soft and smooth surface. I’m a big fan of the two-tone Chili and London colors together, as they pair quite nicely. I’ve always been a fan of natural tan to brown leathers, but I think the deep red adds a little variety while still looking very professional. The darker color will also hide any stains amassed over time and won’t show as much variation due to the accumulation of oils, dirt, stains, etc. This case’s combo of colors gives me the best of both worlds in one. However, if this pair isn’t your thing, there are six other options in the standard model, as well as a custom option that will allow you to pick from a very wide variety of colors in both Bridge and Floater leather. One thing to note is that the lighter Bridge Leathers will darken over time as they are exposed to the elements. You can see this already taking place with side-flip of this case after just three days of use. That is from my hand coming in contact with the inside as I hold the phone with the case open. I do know from the Niko Wallet-Case I reviewed last year that the coloring will even out over time. 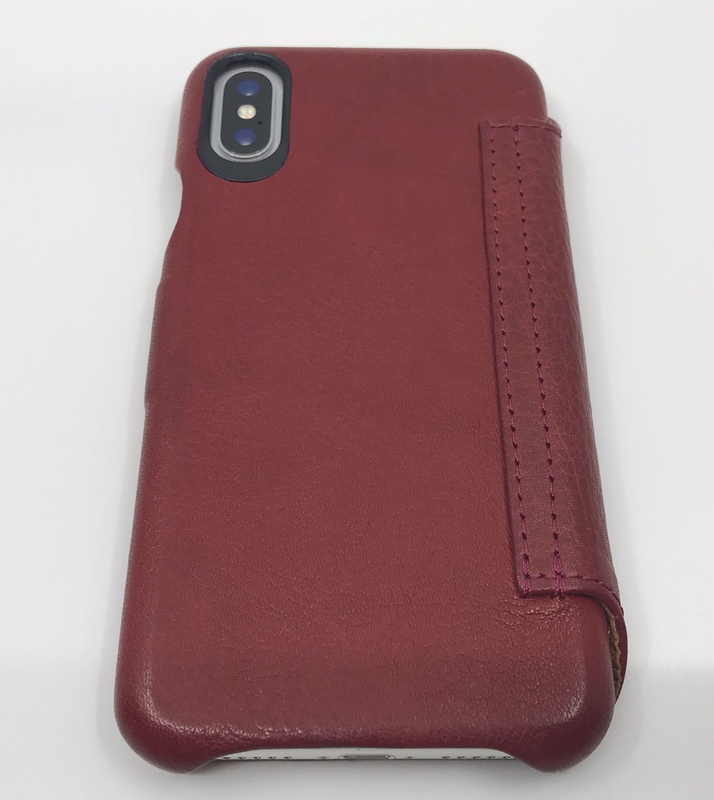 I reviewed Apple’s own Leather Folio case for the iPhone X a few weeks ago, and came away pleasantly surprised by it. 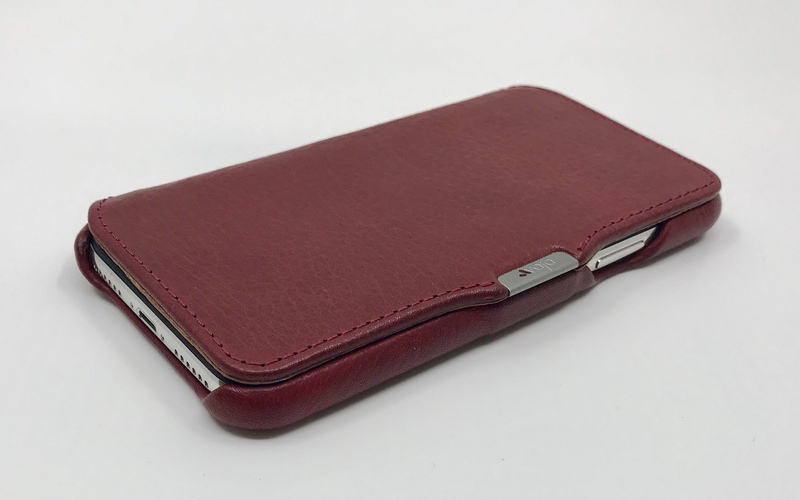 However, one thing I mentioned in that review was that, while the ultra-smooth and very “processed” leather exterior felt and looked nice, it couldn’t quite compare to a Vaja case. This may not be the case for every user, but I personally find the grain and texture of the Vaja case both visually and texturally more interesting and appealing. One thing I always say about iPhone cases is that you can tell the skill and craftsmanship of the manufacturer by the looking at the cut outs and notches for buttons and ports. If you don’t care about the details, it shows up here, where the margin for error shrinks. As I would expect from a Vaja case, all of them are neat, clean, and even. No jaggies. No weird seams. No loose threads. 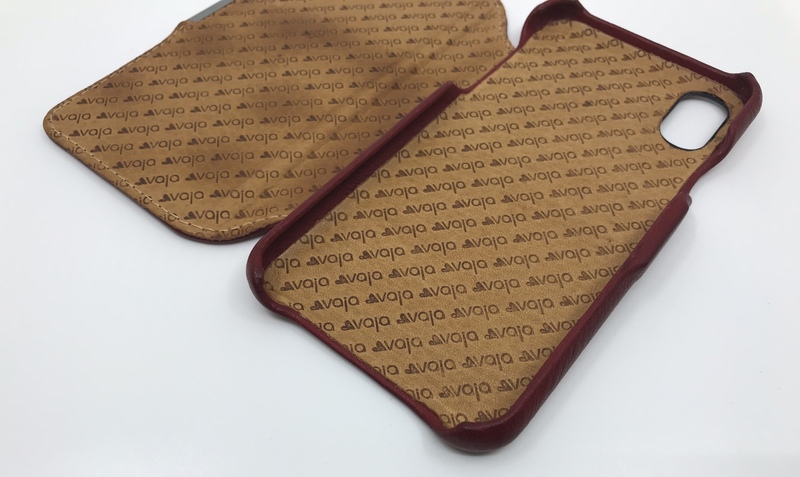 Whether a slim fit or a much bulkier wallet model, all of the Vaja phone cases that I have ever tried out share the same backbone at their core. That core is polycarbonate, which means that there is some protection available beyond just the soft leather exterior. This also adds the necessary amount of rigidity to hold the case securely. One thing that really stands out about this design is how tight and seamlessly the leather is wrapped around the exterior of the case. 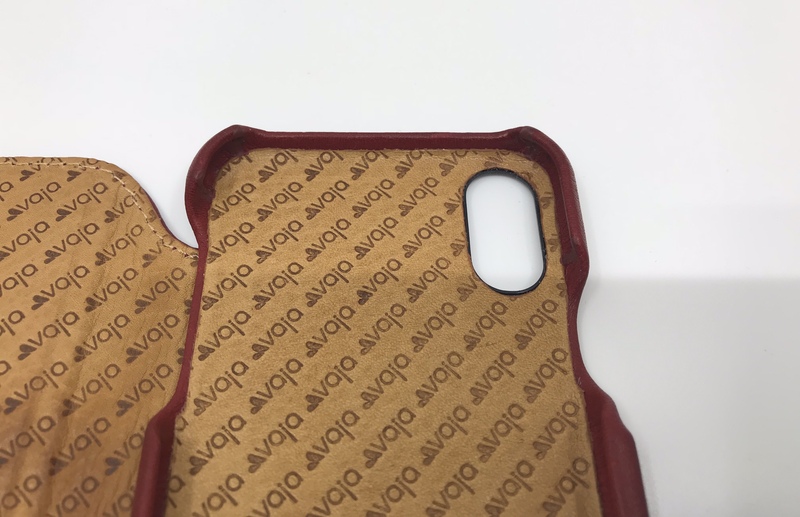 Inside the case, you can see a single seam where the two colors meet. Again, everything is uniform and neatly done. The side-flip section of the case is also polycarbonate wrapped in two-tone leather, and like the front, the material here also is even, tight, and smooth. One item of note is the stitching on both the front and back. As you can see below, it blends in nicely and is very even. The coloring of the stitches also matches the leather, both inside and out. I have seen cases manufacturers use contrasting stitch colors as an accent before, but I personally find that to be a bit overbearing. I much prefer how the matching thread blends into the color of the leather, rather than distracting from it. You can see the same quality and consistency where the side-flip attaches to the back of the case. There are several other nice design touches that make the Agenda MG stand out, as well. I love the little stainless steel tag on the front, with the logo-shaped cut outs that let the red leather come through. 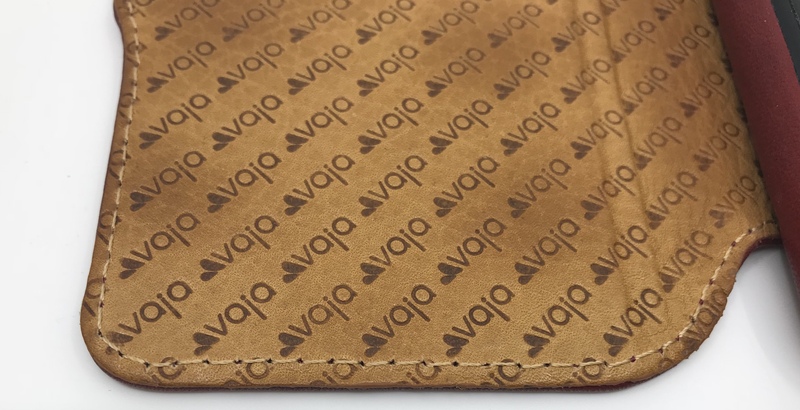 Speaking of logos, the inside of the case is embossed with the Vaja logo in a diagonal pattern, which is an interesting touch. Another thoughtful feature is the small notch cut out of the inside of the side-flip section. This makes makes it easier to make and receive calls with the case closed which is handy for those times you don’t want to hold the side-flip section behind the case. The last thing I will mention is the overall weight of the Agenda MG. The iPhone X is already a bit on the heavy side for its size. This is probably due to the combo of front and back glass combined with stainless steel frame and sides. Thankfully, this case isn’t going to needlessly contribute to that. When you hold this case without the phone, you notice how thin and light it is. This isn’t true of all leather cases, many of which are both thick and very bulky. I appreciate that Vaja struck a good balance between this and providing adequate protection. Functionally, there isn’t much to such a simple case, but there are a few nice differentiators worth mentioning. First and foremost, Vaja has usually used magnetic closures on its wallet and top and side flip cases, which I really like. The Agenda MG also includes this feature, but Vaja freshened it up this year to also trigger the new sleep/wake functionality in the iPhone X. Apple’s Leather Folio is the only other case I’ve seen that makes use of it at this point, but I am not at all surprised to see Vaja already adopting it. Vaja also insures that the Agenda MG case is compatible with Qi Wireless charging, which we also just got in this generation of iPhones. This feature may not be a given with all leather cases, but again, I’m not surprised that Vaja has insured compatibility with theirs. The Agenda MG also does a nice job of protecting the iPhone X while not getting in the way. This case has cut outs on the top, sides, and bottom, three of which are exposed with the side-flip cover closed over the screen. However, the leather covered polycarbonate core of the case has enough thickness to prevent direct contact to the metal exterior of the iPhone X in most instances. You would have to drop it directly on a protruding object to get by this case. Also, since there is a little bit of a gap between the screen and the case, the side-flip cover rests on top of the case, rather than the screen. This small buffer adds just a little extra protection, which can be the difference between a case doing its job and a busted screen. If you have owned a Vaja case before, none of this review will come as a big surprise. Their products are beautifully designed and expertly crafted. They have been in business a long time now in a very competitive mobile device accessory market for a reason. They make great gear and the Agenda MG is just another in a long line of their beautiful leather goods. Now we come to what many of you will see at the only negative- the price. The Agenda MG case for the iPhone X retails for $129, while the custom version (which allows for customer choice in interior and exterior leather type and color) goes for $139. That is a LOT of money, especially after making a commitment to a $1000+ phone, whether through payment plan or outright purchase. However, as someone who sells goods and services myself, I am a firm believer in paying more if the quality of the good or service measures up. When it comes to Vaja products, you ARE getting something more. If you go and buy a $35 leather case and you are happy with it, that’s fine, but you probably aren’t in the target audience for this product. However, if you are the kind of person who would pick up that $35 case and find yourself noticing the flaws and wanting something more, then a Vaja case might just be up your ally. If you think I’m crazy, then go to a site like Cases.com and look around at some of the “luxury brand” competition. 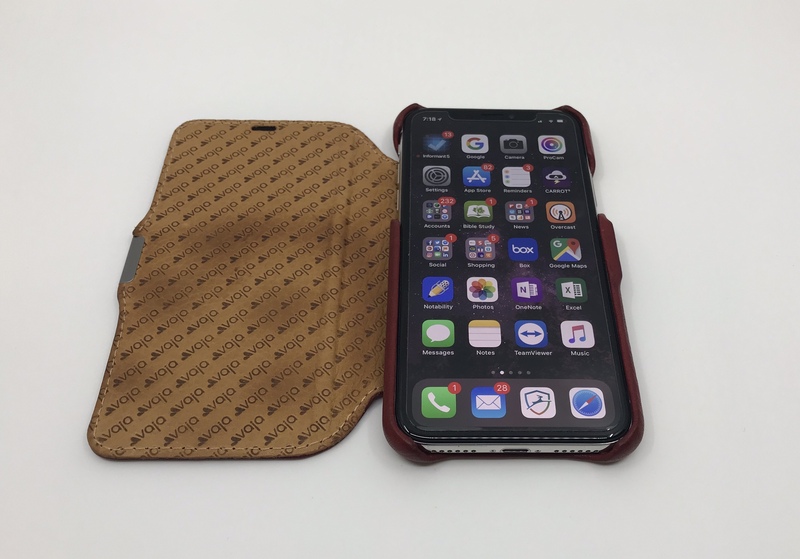 If you research what a premium leather iPhone case costs, then you will see that this $129-$139 price tag is actually right in line with the market. As for me, I don’t see the price as a negative. I’ve tested, owned, and reviewed a LOT of iPhone cases over the years, so I have a very good idea what hand-crafted quality costs. 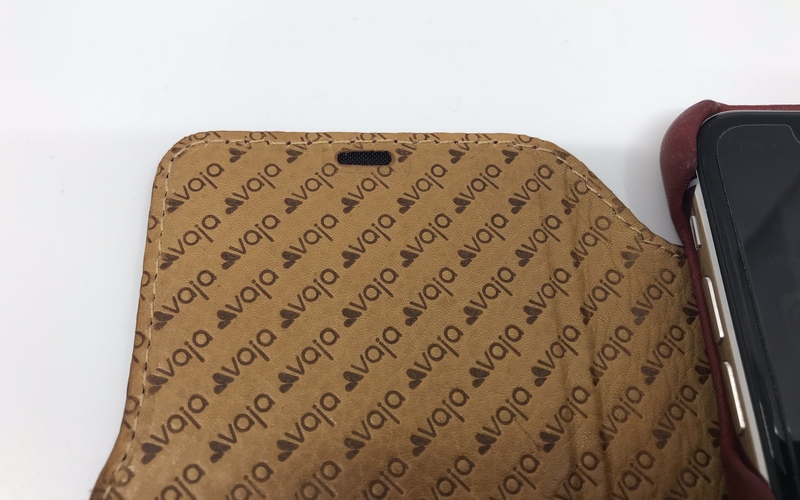 When you buy a Vaja case, the extra money spent is evident in the quality of the product, and I’m good with that. I might buy a different version if left to my own devices (their Top Leather Flip Cases are my personal favorites), but make no mistake- I have paid my own money for Vaja Cases in the past, and will do so again. So while the price can induce sticker shock, the quality and construction of the Agenda MG are equal to it. 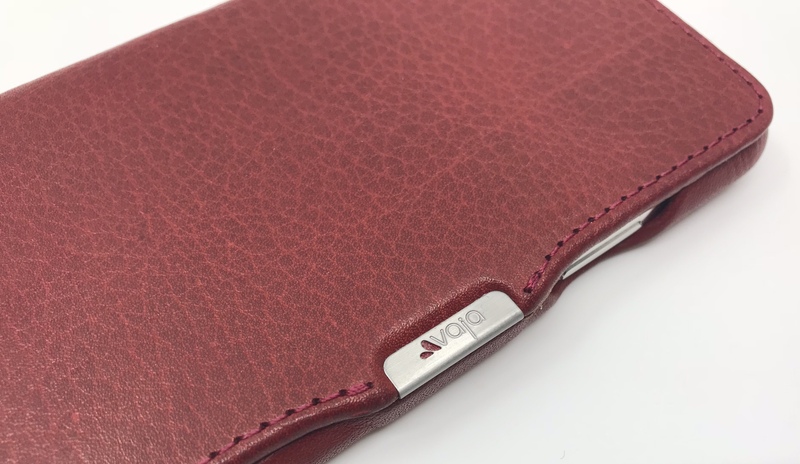 If you are looking for a quality case for your iPhone and appreciate fine materials, quality design, and uncompromising construction, then take a look at Vaja’s Agenda MG case for the iPhone X. You won’t be disappointed. The Agenda MG iPhone X case is available ready to ship in seven colors from Vaja for $129. The custom version offers multiple options of colors, leather type, and accents for $139. Note that the production process for the custom version is 30 business days. The Agenda MG Case was provided for review on iPad Insight by Vaja. For further information regarding our site’s review policies, please see the About page.